Motor abnormalities have been indicated to be a core manifestation of schizophrenia and not just motor side-effects of antipsychotics. However, little is known about whether all of the complete motor function, including fine motor function, muscle strength, and balance is linked to psychotic symptoms. 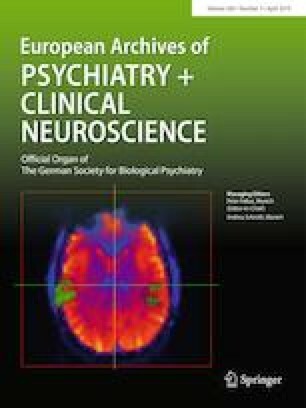 Therefore, this study was to investigate association between complete motor function and psychotic symptoms in young–adult schizophrenia patients who had no extrapyramidal motor symptoms, which were assessed using the Extrapyramidal Symptom Rating Scale. Seventy schizophrenia patients were recruited. Fine motor function, muscle strength, and balance were assessed using The McCarron Assessment of Neuromuscular Development. Psychotic symptoms were assessed using the Positive and Negative Syndrome Scale. Given gender differences in muscle power, the correlation between muscle strength and psychotic symptoms was analyzed by gender separately. Partial correlation controlling for effects of the chlorpromazine equivalent dosage of antipsychotics was conducted. Better fine motor function was correlated with less-severe negative symptoms (r = − 0.49, p < 0.001) in the total sample. In men, better muscle strength was correlated with more severe positive symptoms and less-severe negative symptoms (r = 0.41, p = 0.008; r = − 0.55, p < 0.001). The link between motor function and psychotic symptoms may support the cerebellar and basal ganglia hypotheses of schizophrenia, proposing that diverse schizophrenia symptoms may share the same neural deficiency, that is, dysfunction of cerebellum or basal ganglia. Considering the moderate-to-strong association between muscle strength and psychotic symptoms, muscle strength might be a powerful physical predictor of psychotic progression. The online version of this article ( https://doi.org/10.1007/s00406-019-01004-1) contains supplementary material, which is available to authorized users. We would like to thank Dr. Yu-Lin Liu, Mr. Shyh-Hung Li, and Ms. Chi-Yueh Hsu for the support of subject recruitment and data collection.